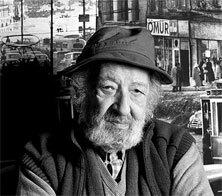 Born on 16th August 1928, Ara Güler is a Turkish photojournalist, also known as Istanbul's Eye. He studied at Getronagan Armenian High School. His father owned a pharmacy, but had many friends that belonged to the world of art. Ara came into contact with these people and they inspired him to opt for a career in films/cinema. He worked in film studios and joined courses of drama under Muhsin Ertuğrul. Later, he leaned towards journalism and abandoned cinema. In 1950 he joined Yeni Istanbul, a Turkish newspaper, as a photojournalist. During the same time, he studied economics from University of Istanbul. Then he started working for Hürriyet. In 1960s, Ara's work was used in books by notable authors as a means of illustration and were shown at different exhibitions around the world. In 1968, his work was displayed at the Museum of Modern Art in New York in a show called, Ten Masters of Color Photography. Moreover, his photographs were also shown in Cologne's fair, Photokina in Germany. Two years later,Türkei, his photography album was published. His images related to art and its history were featured in magazines, like Horizon, Life, Time, andNewsweek. He has won several awards for his work, including Turkey's Photographer of the Century, 1999; Master of Leica, 1962; France's Légion d'honneur; Lifetime Achievement Lucie Award, 2009; and Turkey's Grand Prize of Culture and Arts, 2005. In 2004, he was give honorary fellowship by Istanbul's Yıldız Technical University. Ara also published his photographic books, such as Living in Turkey; Sinan: Architect of Süleyman the Magnificent; Ara Güler's Creative Americans; Ara Güler's Movie Directors; and Ara Güler: Photographs.